Slimtech Delight, the new marble effect collection of ceramic tiles from Lea Ceramiche is available in different variations, offering new tactile sensations, in new sizes. Venato Bianco, with its characteristic, delicate patterns. 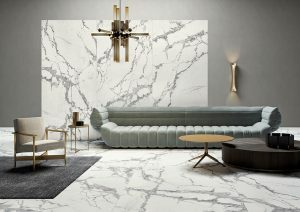 TOUCH, a new matte finish, said to be very soft and velvety to the touch: a surface texture that enhances the veining and depth of the stones, for residential use and for commercial premises with light traffic.